“What the home asks from the mother, from the wife, is not money, but influence, not things, but herself. . . The husband’s key is in the latch; he looks up expectant, and is not satisfied until he sees the brightening of his day in the dear face that makes the sunshine of his world. A weary wife meeting him on the train with a host of business interests, not unlike his own, the absorption of the office in her bearing, and the dust of travel on her skirts, cannot be to him the comforter, the refuge, the rest that his home-staying, home-keeping wife is. . .
What the home seeks of the wife and mother is leisure to listen to its problems, discretion to guide its counsels, and serenity to bless its atmosphere. 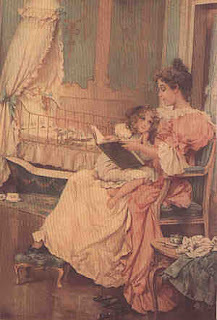 There are times in the life of every young girl when she needs her mother; not knowing which of two or three paths to choose, it is all-important that she shall turn to the woman nearest her on earth, and dearest, for advice and help. Perhaps a boy, at the transitional period between early youth and opening manhood, even more than a girl, needs some one at home, to whom he may carry his perplexities, some one untroubled by the whirl and rush of the hurrying tide of humanity outside the door, some one who can be to a lad in his first hour of temptation, his earliest time of trial, just what a mother and only a mother can be. The biographies of men who have been eminent and successful, and have advanced the world’s work, show with remarkable uniformity that they have had mothers who were the strong forces for good in the background; mothers who thought, and read, and wrought, and prayed, and who were not mere workers in the open mart for wages. The world wants good mothers. It can do without clever money-makers. . . Plain little mothers with the instinct of the hovering wing, they brooded over their children and, little known beyond their doors, diffused heaven’s blessing within them. Thank God for pure, sweet, capable, gentle sympathizing, old-fashioned mothers! For the prevalent temper of the household, for its aroma of fragrance, its sense of proportion of what is owed to God and to one’s fellow beings, we must look to the mother. Her communion with the unseen permeates the visible life of the household, and freshens its every-day air. The ideal wife and mother has higher and finer things to do than to be a breadwinner, unless, in the tempest of life, her husband has been swept away, and she is compelled to leave her natural sphere and toil for her children. . . When all is said, and whatever the circumstances, the best a woman can give her home and her children is herself. Any other thing is merely second best. And whoever so lives that a strong, steadfast, unwavering personality stamps its hallmark on her family, will be remembered by ‘what she has done,’ long after the money that looms so large in her view has become of no value in the world to which we go. There the banker’s strong box, and the millionaire’s securities, and the gewgaws for which men and women barter their souls, will be but as rubbish for the dust heap. For in that land are enduring values, and a crown that shall never lose its luster, a crown of life. Great men have had great mothers. Yet we are mistaken if we limit the influence of mothers by the few examples that have come to us from history. In a generation, here and there, one man or one woman is conspicuous, forced to the front by opportunity, or by a talent for leadership. Thank you for the beautiful reminder that my work at home is worthwhile and honorable. what a beautifully written piece on the value of the mother!!! Thank you for sharing! This book is available as an online read. But, the best thing any mother can do for their home, is to pray. When all is said and done, the housework, laundry etc, it is our time spent with God that will make that home what God wants it to be. Thank you Thank you Thank you! What an inspiring post today! Hmm, I don't like the article's seeming indication that a working woman is a failure as a wife. Other than that, it's nicely encouraging. I really like the additional note about sons needing mothers too. "When all is said and done, the housework, laundry etc, it is our time spent with God that will make that home what God wants it to be." I'm reminded of Elizabeth George's words: "The quality of our time spent among others can only be determined by the time spent alone with God." How awesome! A great reminder of our blessed calling as mothers and wives. We set the tone for our homes, whether it be a sweet aroma or a smelly odor. What a privilege it is that God gave to women. Even as our husbands are the head of our homes, we are the ones with a tremendous influence for the next generation! Thank you for this awesome reminder of our roles in the home!! I can honestly attest to the reference of a man's need to see his wife, not on the train at the end of a hard day's "business" work for both of them; but, rather, a man's desire is to see his wife in the sanctuary of his home, making the sun shine on his piece of earth. My husband and I worked and toiled in the "business world" together (and apart) for nearly 11 years before our first son. I then came home on a "part-time/work from home" basis for just over a year. I have now been in my home, in my true calling, as wife and mother for 1.5 years, and we are now expecting our 3rd baby (in under 3 years)…what changes! While my husband doesn't always come home to "peace and tranquility" (in a home filling up with toddlers)–he does come home to me–earnestly engrossed in his home and kingdom. He told me the other night that this is the happiest and most satisfied that he has been in nearly 14 years of marriage. (And we have had an idyllic marriage, in both our estimations.) What a tremendous blessing to my heart, and our home!! In even further confirmation of the perfect will of God in our lives as believers, my brother-in-law (my sister's husband) commented to my husband that he wants his wife to be a stay-at-home wife and mother. He noted that he sees the confidence and peace in my husband, and as a new believer, he wants that kind of joy in his home…which, in great part, is due to committing our home in the hands of God and discovering His desires in our roles, as husband, wife and parents. I thank God for His grace in placing me (reluctantly, at first), in His true calling for my life. I am reminded each day that this is the most satisfying, and sanctifying, work that I will ever do. Thank you, Mrs. McDonald, for your book (Passionate Housewives…). That book hit me in the heart with the most powerful message known to man…the Word of God. Since I read that book 2.5 years ago, we (my husband and I) have called this season of our lives, the "Transformation". We count it a blessing to have brothers and sisters in the faith (that we may not meet here on earth), that are real in their encouragement to press closer to the One and Only, the Great I AM. Thank you so much for sharing. I copied your comment into a post today. Would you mind writing me privately? I can't locate your email address. Thanks! So glad to read this! I am in the midst of a facebook debate about young ladies having being a mom and wife as their first "goal" that they should keep in mind as they plan for their future. It began when a lady posted excitedly about her daughters' plans – one to be a pilot, one to go for her MD. I mildly mentioned a higher calling to prepare for – folks, even Christian, home school folks, do not really want to hear this teaching. I said, God's plans never contradict His word. And so on. I am going to forward this to one of the dear ladies involved. Thanks. It could very well be, Susan, that this young woman is called to be a pilot or an MD. No one but God can say what her future is. Just to reiterate, God's plans never contradict His Word, which says "…train the younger women to love their husbands and children, to be self-controlled and pure, to be busy at home, to be kind, and to be subject to their husbands, so that no one will malign the word of God" Titus 2:4. It is striking to me that the simple truth about a woman's role is so rejected by some in the church. People always seems to think "their situation" is going to be the exception. My two teen daughters and I just viewed the video you suggested…interesting, especially Greer's cavalier brush-off of children needing nurture from someone with their needs foremost. The video obviously didn't mention any motivation from the Lord, just the women's desire to be at home. The home-stayers just "liked" being at home. Good start – me too! I already commented here, but I wanted to let you know that I linked to this article in my blog post: Homemaking: An Invaluable Calling. Susan, it is not a fanciful career: hundreds of women are pilots and this is not a male-oriented career either, the way physical combat is. Being a mother and being a pilot, especially if the latter comes before the former, is not either an unBiblical nor an unrealistic idea. The simple truth is not that the Bible commands all women to do one thing; that idea is what so many reject.